The Rwanda Medical Journal (RMJ), is a Not-For-Profit scientific, medical, journal that is published entirely online in open-access electronic format (click here). The RMJ was created in 1967 and intends to be published indefinitely. By submitting your manuscript to the RMJ it is understood that it is an original manuscript and is unpublished work and is not under consideration elsewhere. Plagiarism, including duplicate publication of the author's own work, in whole or in part without proper citation is not accepted by the journal. Manuscripts submitted to the journal may be checked for originality using plagiarism software. Authors do not incur charges for submission or publication. The RMJ is a peer-reviewed journal following a double “blind” peer-review model. This means that reviewers will not know your identity and likewise we will not provide you with details of our peer-reviewers. We will provide reviewers with your designation and country of employment to provide relevance to the manuscript. After initial screening by the chief-editor and the editorial team, which takes only a few days, manuscripts are reviewed by at least two independent peer-reviewers. The journal aims to give decisions on manuscripts within 6-8 weeks. The editorial team uses plagiarism software to screen all submitted articles. Any related or discovered plagiarism disrupts the credibility of the article and leads to its immediate and full rejection. In cases where significant plagiarism is identified, the editorial team may, at their discretion, contact the line-manager (supervising clinician) of the offense. Duplicate publication: Duplicate publication is publication of a paper that overlaps substantially with one already published, without clear, visible reference to the previous publication (ICMJE). When authors submit a manuscript reporting work that has already been reported in large part in a published article or is contained in or closely related to another paper that has been submitted or accepted for publication elsewhere, the letter of submission should clearly say so and the authors should provide copies of the related material to help the editor decide how to handle the submission. 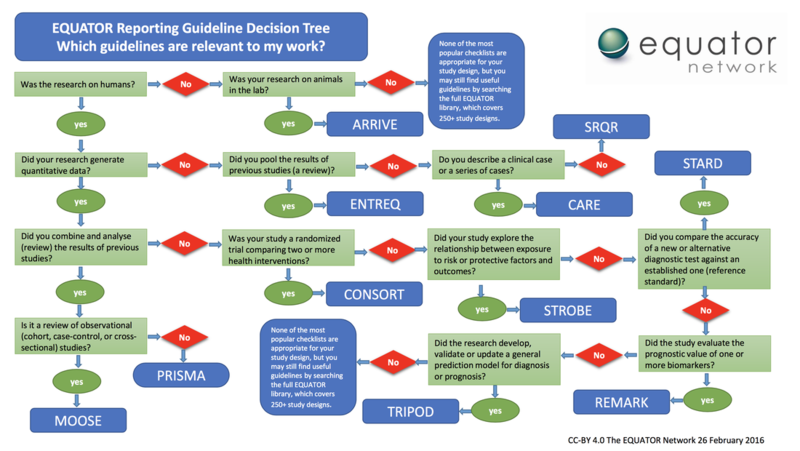 We strongly recommend that authors use a Checklist (reporting guideline) to review their manuscript, prior to submitting. Where possible state in your manuscript which checklist you have employed (more information is available from the Equator Network (http://www.equator-network.org/). Figures: Maximum four produced to high quality. Tables and figures should be presented at the end of the manuscript after the references, single-spaced, each table and figure on a separate page, starting with a "page break." Trial registration and Institutional Review Board (IRB): The IRB reference code should be reported in all manuscripts as the last line of the manuscript abstract. The trial registration number should be included where relevant. iii. Best-evidence topics (BETs). These are not systematic reviews but critical review articles of evidence related to a specific clinical question. Contact Dr. Peter Cartledge (peterthomascartledge@gmail.com) for more details and a Word template. These should be a well-described case for educational purposes and/or to extend scientific knowledge regarding unique clinical cases. These can contain unusual features of disease, treatment, transmission and/or control. Structure: the manuscript should be divided into the following sections: Keywords, Short running Title, Abstract. Introduction, Case(s), Conclusions (see writing rules & styles below for more information). Abstract: A short abstract (maximum 100 words) can be provided using the following two subheadings: Case, Discussion. Figures: Maximum three produced to high quality. Consent: Informed consent must be documented. A signed written consent from the patient should be provided for any potentially identifiable images. Images are accepted and encouraged with the same instructions as case-reports and therefore they should include a description of the case (as above). Written consent should be obtained from patients and a copy of the consent form included with the submission. Figures: Maximum 4 produced to high quality. Tables and figures should be presented at the end of the manuscript after the references, single spaced, each table and figure on a separate page, starting with a “page break”. 5. Editorial/Opinion articles:Editorials are short opinion papers. These articles might mostly be object to critical and opened discussion categorized as ‘’commentaries‘’. These are normally commissioned and should always be discussed with the editorial board prior to starting work on the manuscript. Tables and figures: Maximum 2 (e.g. 1 Table & 1 figure) produced to high quality. Tables and figures should be inserted in the text where they would appear in the manuscript. Do not attach as appendices. Discussion: What are the implications and potential for wider application. Figures: Maximum 4 - produced to high quality. Trial registration and Institutional Review Board (IRB): Quality Improvement projects do not require IRB review for publication. However authors should state that the project has been reviewed by the local hospital. No patient identifiable information should be included. Any images of humans should come with consent. These are short pieces commenting on articles published through RMJ within the last 6 months (i.e. last two issues). These could include advocacy of a published RMJ article with a supporting argument or case etc. A rebuttal of a published RMJ article with supporting evidence would also be appropriate. Letters to the editor only receive peer-review by 1 reviewer, and commentary is sought from the author of the original article. Final acceptance is at the discretion of the chief-editor. References: IEEE style, maximum five references (if commenting on a previous article from the RMJ then please reference this). The submitted manuscript should be referenced with IEEE referencing, and text style should be as per Oxford University Press Style Guide (Click here). The title of the article should be concise and informative. Objective: stating the purposes/aims of the work; the research undergone, the hypothesis tested or the procedure evaluated. Methods: briefly stating what was done and what materials were used, including the number of subjects, the methods to assess the data and to control bias. Results: providing the findings of the study, including indicators of statistical significance, actual numbers, as well as percentages. Conclusion: Summarizing in 1-2 sentences the conclusions of the work on the basis of the results. It emphasizes new and important aspects of the study or observations. Keywords: Following the abstract. Up to five keywords or short phrases that assist indexers in cross-indexing the article. These should be terms found in the Medical Subject Heading (MeSH) index (https://www.ncbi.nlm.nih.gov/mesh/). These keywords are published with the article. Abbreviations should be spelled out the first time a term is given in the text. Introduction: should always begin the text, and requires brevity and focus. Long articles may need subheadings to clarify their content. Different articles may be adapted according to their type. It conveys the nature and purpose of the work and quotes the relevant literature. Only strictly pertinent background information is necessary for understanding why the topic is important and why the study was undertaken. We suggest that the final paragraph clearly states the hypothesis or purpose of the study. Methods: Details of clinical and technical procedures should follow the introduction. A clear description of the selection of the observational or experimental subjects should be given. The identification of all aspects of the study, it’s reasoning, and the related relevance should be explicitly justified. The criteria for subject exclusion or inclusion should be discussed. Identify in sufficient detail the methods, instrumentation, procedures, and all drugs and chemicals used (including generic names, doses, routes of administration) to allow other workers to reproduce the study. Results: A logical sequence of presentation of results is required in the text; along with tables, and illustrations. Repetition of data from illustrations into the text should be avoided; however, emphasizing or summarizing important observations can be helpful. Define all statistical terms including abbreviations and/or the most used symbols. Any complications and/or unexpected results should be reported and the plausible explanation(s) given. The authors should also report losses to observation, such as dropouts from a clinical trial. Statistics: Statistical methods should be described with enough details to enable a knowledgeable reader with access to the original data to verify the reported results. Claim of priority and alluding to work that has not been completed. Emphasize the new and important aspects of the study and the conclusions that follow from them. Avoid repetition of details included in other parts of the manuscript. This section requires that the limitations of the study are mentioned. New hypotheses can be suggested when warranted, but they should be clearly labeled as such; and recommendations, when appropriate and needed, may be provided. Acknowledgments: List all contributors who do not meet the criteria of authorship, such as those who provided purely technical help, writing assistance, or a department chair who provided only general support. Their respective contribution will be acknowledged as provided. Each contributor must have provided permission to be acknowledged. We strongly recommend the use of a referencing manager such as Mendeley. If using Mendeley, please submit manuscripts with the Mendeley links intact rather than plain text. DOIs (Digital Object Identifiers) should be included in all references, where available. This can be done automatically by importing the articles into Mendeley and then referencing. This journal recommends that authors use a reference manager (e.g., Mendeley) to cite and manage references. IEEE is available on Mendeley. If citing unpublished work, the authors are responsible for obtaining permission and confirming the accuracy of the work. The name of the author who will deal with correspondence and proofs; His/Her email address must be submitted with the manuscript. For animal or human studies that involve data collected actively and purposely, we require a signed statement from the corresponding or primary author that ethical approval was granted by an appropriate institution. Institutional Review Board (IRB), or equivalent, letters of approval should be submitted with the manuscript. IRB, or equivalent, reference codes should be included in the manuscript. 1. Accompanying letter: summarising the work and the importance of the manuscript. This should also state that the work is original (not submitted elsewhere) and that all named authors have taken responsibility for the work. 2. Author details: A separate Microsoft Word file with all the authors’ names preceded by initials of their first names, affiliated institutions, as well as the name and full address of the corresponding author should be provided. Please ensure that all names and affiliations are correctly spelled as this is how they will appear in final print. Though not a requirement, we strongly recommend that all authors register with http://orcid.org and provide their ORCID addresses within this document. These will then be included in the article. 3. Manuscript: A Microsoft Word file without any author information within the document. Single spaced. 12 font, Times New Roman. Tables should be presented at the end of the manuscript after the references, single-spaced, each table and figure on a separate page, starting with a "page break." 4. Figures: When figures are used, they should be submitted as a separate high-quality image file (e.g., TIFF, JPEG, etc.). Please note that if you have taken a figure from another source you will need to ensure that you have permission to use it from the Copyright holder. Alternatively you will need to create your own distinct figure. Our journal is published entirely online therefore color figures can be provided. We adhere to the criteria of the ICMJE (International Committee of Medical Journal Editors). Please consult the ICMJE website for more information. We require confirmation that ALL authors have read, understood, and are bound to the journal rules. · Agreement to be accountable for all aspects of the work in ensuring that questions related to the accuracy or integrity of any part of the work are appropriately investigated and resolved. NB: The RMJ does not publish papers that make use of data, infrastructure, or personnel in a foreign country without involving at least one scientist from that foreign country as an author. Any involvement not included in these criteria would be considered as ‘’Contributorship‘’. Before assessment of the authorship declaration, ALL authors must be aware of it and agree to be listed. All authors should agree that no person who meets the criteria (above) has been omitted and that conflicts of interest are acknowledged and fully declared. Whether the authors had access to the study data, with an explanation of the nature and extent of access, including whether access is on-going. Articles may be sent to “type editors” at the discretion of the editorial team. Type editors are proficient/native English speakers who will amend the manuscript to enhance the grammar and spelling. Type-edited amendments are sent to the authors in Tracked changes format. Type editing does not incur a charge on the authors. All original articles, case reports, and review articles are sent for peer review. Commissioned articles are also subject to standard peer-review procedures. Peer review aims to ensure that all authors receive feedback as well as the decision regarding their submission. A minimum of two experts reviews submitted manuscripts. The review follows a double-blind peer review process meaning that reviewers are not given any identifying features of the authors of the manuscript. Authors are provided with feedback from the peer review, and this is anonymized. 5.Reject initial submission entirely: with no opportunity for resubmission. Decisions of whether to accept or reject a manuscript are based on the reviews given by peer-reviewers. The peer-review form is available below as an appendix. Many authors find it helpful to read this and rework their manuscript using the information held in this peer-review form. The journal uses a double-blind peer review process for the review of manuscripts submitted for publication in the journal. Articles Approval and Publication: Every article shall be reviewed by a minimum of two independent peer-reviewers before they are accepted (except letters to the editor). The journal uses a double-blind peer-review process. In case the committee believes that the article would require a substantial redrafting, suggestions shall be made and the reviewers shall proceed with a review of both style and language. Articles shall remain the authors' property even after publication. For any published article, the author shall access the entire content as published through the journal online web publisher: www.bioline.org.br/rw. Publisher: RBC / Rwanda Health Communication Centre, P.O.Box 4586 / Kigali Rwanda.